I was gifted a copy of ‘Entertaining from an ethnic Indian kitchen’ this Christmas, with a precious note on the inner jacket – a gift filled with love and serious thought. I wondered for a bit though, as I’m not much of a cook, to be completely honest. But as I slowly turned the pages of the beautiful hard cover, 320 page book in my hands – I lost myself in, of all things…Indian food and entertaining. 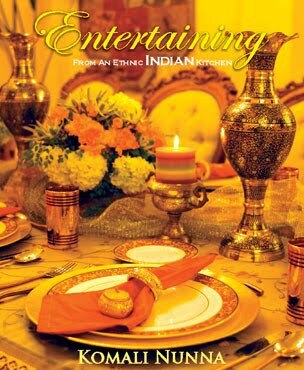 ‘Entertaining from an ethnic Indian kitchen,’ took me quite by surprise. It’s not your regular cookbook, with recipes, a few pretty pictures, a glossary of measurements and what not , perhaps a pretty picture of the author at the end. Oh my, no. Each page turned out to be a delightful symphony of sharing, talent and grace. Being a self confessed cooking novice, I’ve mastered the art of rushing through the difficult recipes. You know how some just have these unheard of spices and foreign sounding vegetables? Komali Nunna’s book entertains none of that. The recipes are beautifully uncomplicated in explanation, yet phenomenally unique, once prepared. You’re sold on the beautiful photography of food, tables, spices and arrangements almost immediately and once you realise how simply explained the actual recipe is…I found myself looking forward to the next evening I’d get to try them out. One of the things I loved most, was the manner in which the book effortlessly flowed onward. It began with an introduction to the author- a proper glimpse into the person she was and has now become; then slowing moving on to her love for entertaining and elegant, tasteful, fun decoration and then finally, the mouth watering entrees, mains and deserts. Komali takes you through everything – from how to buy your vegetables, to table décor and party themes, to tarts and tea parties, naans and kabobs – she even tells you how to crack a coconut. I kid you not. Page 302. As opposed to other cookbooks, segregated based on meat, fish, chicken etc, Komali sectioned her book according to theme, which I thought was a brilliant idea. You’ll find the most gorgeous table décor ideas and menus for Snack and Chaat parties, Tea Parties, Moghul Banquets and Kerala Feasts; to name a few. And once you’ve spent many a pleasant hour going through those, Komali surprises you with a section of Indian regional cuisines and festivals. You will not only find the much loved delicacies of India and her famed celebrations, but also a warm introduction to the featured region or festivity. Here’s a lovely little spoiler for you though – wait till you get to the end and see the Thanksgiving and Christmas menus. WOW. So much talent, so much simplicity, so much warmth. And yes, I do believe that any bride who receives this as a wedding present will be quite over the moon. It isn’t just a cookbook, but an inspiration to live ones dream. Komali Nunna, you are a revelation. To read more about Komali and her various passions; do check her site http://www.komalinunna.com/ and her lovely blog http://komalinunna.blogspot.com/. What an eloquent review. You sound like an author yourself. Rose, that was a beautifully worded review. What a beautiful review, Rose. I can not ask for any better review than this. Thank you so much. I am honored. Love you all. Beautiful writing style, honest and interesting review. Reading this post makes me yearn to get this book soon. I borrowed it from the library few weeks ago, it is a neat book with lots of good ideas.